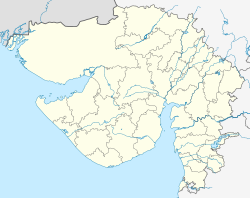 Surat, previously kent as Surya, is a ceety in the Indian state o Gujarat. It is an aa admeenistrative caipital o the Surat destrict. The ceety is locatit 306 km sooth o the state caipital, Gandhinagar, an is situatit on the left bank o the Tapti River (Tapi), the center bein aroond 22 km (14 mi) frae the river's mooth. Surat is Gujarat's seicont lairgest ceety an Indie's aicht maist populated ceety (in terms o population livin in the Municipal Corporation aurie), wi a population o 4.5 million. The ceety registered an annualized GDP growth rate o 11.5 per cent ower the seven fiscal years atween 2001 an 2008. A moat divides the aulder pairts o the ceety, wi its narrow streets an handsome historical hooses, frae the newer suburbs. The ceety is lairgely recognized for its textile an diamond businesses. It is an aa kent as the diamond caipital o the warld an the textile capital/Manchester textile ceety o Indie, a distinction it teuk ower frae Ahmedabad. 92% o the warld's diamonds are cut an polished in Surat. ↑ Adiga, Aravind (2004-04-12). "Uncommon Brilliance". Time Magazine. Archived frae the oreeginal on 2010-01-16. Retrieved 2007-10-17.